While apparently Troy Baker won't be returning to the Borderlands series to reprise his role as Rhys from Tales from the Borderlands, another well-known voice actor is coming back. Ashly Burch will return to portray Tiny Tina (now several years older, as seen in the trailer) in Borderlands 3 as confirmed by Randy Pitchford on Twitter. You may know Burch for her role as Chloe in Life is Strange or Miss Pauling in the Team Fortress 2 shorts or herself in Hey Ash Whatcha Playing? which she appeared in alongside her brother, Anthony Burch. 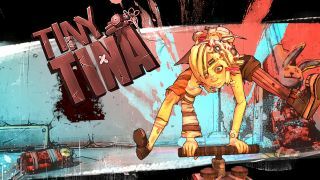 To bring it back to Borderlands, when Anthony Burch created Tiny Tina in Borderlands 2 he based the character on his sister, but she had to audition for the role just the same. Enjoy having that fact inside your brain. Borderlands 3 will be released on September 13.